Like Hank Aaron, Al Downing also achieved some notoriety 40 years ago today. As a starting pitcher for the Dodgers that season, he gave up Aaron’s 715th career home run, pushing him past Babe Ruth. Al Downing began his career with the Yankees. 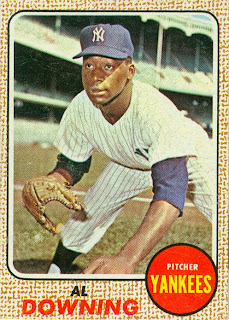 He was signed by New York in 1961, and along with 12 starts at class-A Binghamton, Downing made his debut with the Yankees on July 19th, pitching 5 games with the Bombers between mid-July and mid-September. 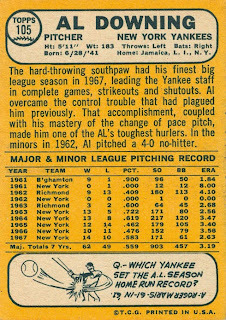 He spent the 1962 season back in triple-A, only pitching 1 inning for the Yankees on September 30th. In 1963 he began the season in the minors, but was called up in early June, joining a rotation of Whitey Ford, Ralph Terry, Jim Bouton, and Stan Williams. 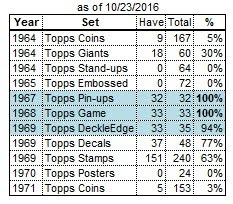 Al pitched in 24 games from 6/7 to the end of the season. He finished his rookie season with 22 starts, 10 complete games, a 13-5 record, 171 strikeouts, and a 2.56 ERA. He also pitched in one game against the Dodgers in the World Series. 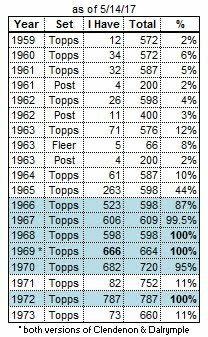 The following season would be the Yankees last good season for over a decade. Downing, along with Ford and Bouton, comprised the “Big 3” in the starting rotation. Al led the league with 217 strikeouts (but also led with 120 walks). In February 1971, the Brewers traded Downing to the Dodgers for outfielder Andy Kosco. Al pitched for the Dodgers for 6½ seasons. His best season in LA was his first – winning 20 games, leading the NL with 5 shutouts, and finishing 3rd in the Cy Young voting. 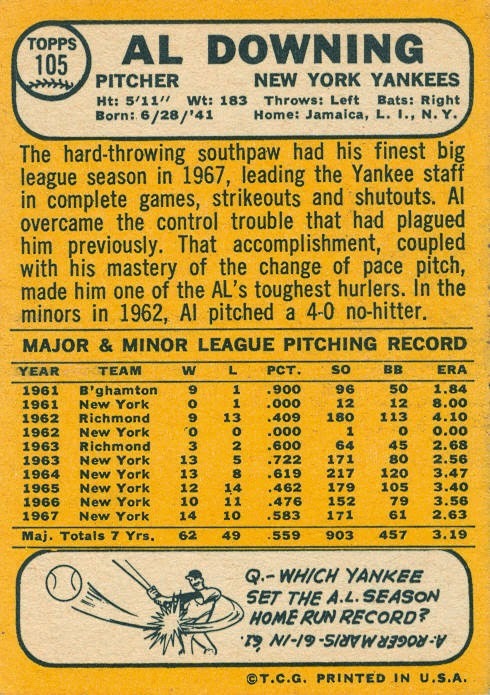 He continued as a starter through the 1974 season, then became primarily a reliever in his last 3 seasons. Downing’s last game was on July 13, 1977. He was released a week later, ending his 17-year career.